The Federal Reserve reported that manufacturing production rebounded in February, up 1.2 percent, after edging down 0.2 percent in January. 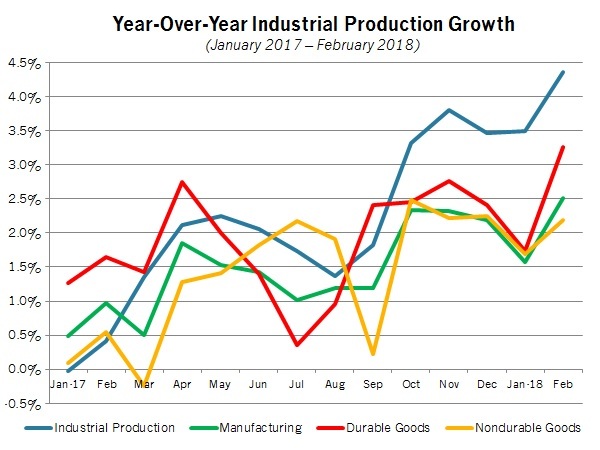 That was the fastest monthly pace of growth since October, and overall, the data continue to show healthy growth for manufacturers, with strength last year carrying over into this year. Indeed, manufacturing production has risen 2.5 percent over the past 12 months, up from 1.6 percent last month and the best year-over-year rate since July 2014. Similarly, manufacturing capacity utilization jumped from 76.0 percent in January to 76.9 percent in February, a reading not seen since April 2008. At the same time, total industrial production jumped 1.1 percent in February, or 4.4 percent year-over-year, the highest rate since March 2011. The data were supported by strength in the New York and Philadelphia Federal Reserve Bank districts in their March manufacturing surveys, with respondents quite positive about current activity and in their economic outlook. The labor market has tightened significantly as a result of strength in the manufacturing sector and larger macroeconomy. For instance, there were 427,000 manufacturing job openings in January, up strongly from 374,000 in December. That was the best number since September’s reading (445,000), which was the strongest since January 2001. The manufacturing sector hired 360,000 workers in January, just shy of the 364,000 employees hired in August, which was the strongest rate since November 2007. Net hiring (or hires minus separations) registered 8,000 in January but has averaged a rather healthy 14,500 over the past 12 months. Meanwhile, job openings for nonfarm payroll businesses soared to 6,312,000 in January, a new all-time high. Positive economic news—especially in the jobs market—has helped to lift consumer confidence. The Index of Consumer Sentiment from the University of Michigan and Thomson Reuters jumped to 102.0 in March, the highest level since January 2004. The press release notes that those individuals with higher incomes felt less upbeat in the most recent survey—likely from volatility in equity markets and the impact that has on personal finances—but that was not enough to drag down the headline index. Indeed, Americans felt more positive about current economic conditions (up from 114.9 to 122.8), with that measure soaring to a new all-time high. Despite robust consumer assessments about the economy, retail spending declined 0.1 percent in February for the third straight month, starting the new year off on a disappointing note. Motor vehicle and parts sales fell 0.9 percent in February, decreasing for the fourth consecutive month and one of the larger drags in the latest report. Along those lines, retail spending excluding automobiles increased 0.2 percent in February. Nonetheless, the larger narrative remains encouraging, with consumers being a bright spot over the past year. Indeed, retail sales have risen 4.0 percent year-over-year in February, suggesting a decent pace overall even if it represented a deceleration from the more robust rate of 5.9 percent in November. Excluding motor vehicles and parts, the pace was somewhat stronger, with retail sales up 4.4 percent over the past 12 months. Turning to the housing market, new housing starts declined 7.0 percent from an annualized 1,329,000 units in January—the fastest pace since August 2007—to 1,236,000 units in February. Yet, there were some positives to note in the latest report. First, for the fifth straight month, housing starts exceeded 1.2 million units at the annual rate, which suggests that we might finally have breached and sustained that threshold of activity, which is promising. Second, single-family housing starts rose to 902,000 units in February. It was only the second time since September 2007 that single-family construction activity has risen above 900,000 units, following the rate of 946,000 units in November. The softness in the February housing starts data came from the multifamily segment, which is highly volatile from month to month. Housing permits also weakened, down from an annualized 1,377,000 units in January—also the best reading since August 2007—to 1,298,000 units in February. Much like the starts figures, this was the fifth consecutive month with permitting above 1.2 million units, and the trend continues to be a mostly heartening one. On a year-over-year basis, housing permits have risen 6.5 percent, up from 1,219,000 in February 2017. With that in mind, the permits data—while somewhat reduced in February—continue to signal strength in the housing market in the coming months, as this measure is a good proxy for future construction activity. In that way, it mirrored solid assessments from homebuilders, who remain very upbeat about single-family sales in their outlook. Finally, the beforementioned regional Federal Reserve Bank surveys both reported that input costs were elevated, with measures for raw material prices at their highest level in at least five years. Along those lines, consumer and producer prices both increased 0.2 percent in February. Reduced energy costs in February helped to ease pricing pressures after solid gains in January. Overall, however, prices have picked up somewhat, even if some modest acceleration should be expected given the low levels of inflation over much of the past two years. The consumer price index has risen 2.3 percent over the past 12 months, the fastest year-over-year pace since March 2017, and producer prices for final demand goods and services have increased 2.9 percent year-over-year. Core inflation, which excludes food and energy costs, was 1.9 percent year-over-year for consumers and 2.7 percent for producers. The Federal Open Market Committee (FOMC) meets on March 20 and 21; it is expected to raise short-term interest rates for the first time this year. The Federal Reserve will be reacting to stronger economic growth and an ever-tighter labor market in its move toward normalizing monetary policy, with the FOMC anticipated to increase the federal funds rate at least three (and maybe four) times in 2018. It is also continuing to reduce the size of the Federal Reserve’s balance sheet, a process that has been ongoing since last fall. The Census Bureau will release preliminary numbers for durable goods orders and shipments for February this week, which were softer than desired in January but have been quite robust over the past 12 months. In addition, new surveys from IHS Markit and the Kansas City Federal Reserve Bank will provide new clues about manufacturing activity. Other highlights this week include new data on existing and new home sales, leading indicators and state employment. With that in mind, the permits data—while somewhat reduced in February—continue to signal strength in the housing market in the coming months, as this measure is a good proxy for future construction activity. In that way, it mirrored solid assessments from homebuilders, who remain very upbeat about single-family sales in their outlook. The Federal Reserve reported that manufacturing production rebounded in February, up 1.2 percent, after edging down 0.2 percent in January. That was the fastest monthly pace of growth since October, and overall, the data continue to show healthy growth for manufacturers, with strength last year carrying over into this year. Indeed, manufacturing production has risen 2.5 percent over the past 12 months, up from 1.6 percent last month and the best year-over-year rate since July 2014. Similarly, manufacturing capacity utilization jumped from 76.0 percent in January to 76.9 percent in February, a reading not seen since April 2008. In February, durable and nondurable goods production rose 1.8 percent and 0.7 percent, respectively. The largest monthly increases included motor vehicles and parts (up 3.9 percent), nonmetallic mineral products (up 3.9 percent), wood products (up 2.6 percent), miscellaneous durable goods (up 2.5 percent), furniture and related products (up 1.9 percent), machinery (up 1.6 percent), computer and electronic products (up 1.5 percent), plastics and rubber products (up 1.4 percent), aerospace and miscellaneous transportation equipment (up 1.3 percent) and apparel and leather (up 1.0 percent), among others. Only two manufacturing sectors—out of 19—saw declining production in February: petroleum and coal products (down 2.8 percent) and electrical equipment, appliances and components (down 0.8 percent). Meanwhile, total industrial production jumped 1.1 percent in February, recovering from the 0.3 percent decline in January. In addition to manufacturing, mining production soared 4.3 percent in February, but utilities output fell 4.7 percent, likely due to warmer temperatures. Over the past 12 months, industrial production has risen 4.4 percent, the highest rate since March 2011. Mining and utilities output increased 9.7 percent and 10.5 percent year-over-year, respectively. In addition, capacity utilization rose from 77.4 percent to 78.1 percent, the strongest rate since January 2015. To put the current numbers in perspective, the HMI stood at 58 and 71 in March 2016 and March 2017, respectively. Readings greater than 50 suggest that more homebuilders are positive than negative in their economic outlook. The HMI has exceeded 50 in every month since July 2014 and has surpassed 60—which would signify robust growth—for 19 straight months. In the latest data, sentiment strengthened in the Northeast but was somewhat softer in other regions. Manufacturing activity in the New York Federal Reserve Bank’s district continued to show solid gains in manufacturing activity in March. In the latest Empire State Manufacturing Survey, the composite index of general business conditions rose from 13.1 in February to 22.5 in March. After decelerating for four straight months from the three-year high of 28.8 in October, it was encouraging to see the headline index rebound once again. Many of the key underlying data points also increased in March, including faster expansions for new orders (up from 13.5 to 16.8), shipments (up from 12.5 to 27.0), the average workweek (up from 4.6 to 5.9) and inventories (up from 4.9 to 5.6). Hiring slowed somewhat on net (down from 10.9 to 9.4), but, interestingly, the percentage of respondents suggesting that employment for their firms had increased for the month improved, up from 18.9 percent in February to 25.8 percent in March. The easing in the index stemmed from a pickup in those suggesting that hiring was lower, up from 8.0 percent to 16.4 percent. As we have seen in recent months, pricing pressures continued to increase. The prices paid index rose from 48.6 to 50.3, the highest level since March 2012. Indeed, more than half of respondents said their input costs increased in March, with just 2.8 percent saying they were lower. The forward-looking inflationary measure suggested this trend should continue, with the expected prices paid index rising from 52.1 to 55.9, the fastest pace since May 2012. Despite the increased pricing pressure, manufacturers in the New York Federal Reserve’s district remained very upbeat about the next six months. The future-oriented composite index declined from 50.5 in February—the best reading since January 2011—to 44.1 in March, a number that still suggests a very robust outlook. The underlying data mostly decreased, but showed promising signs overall, including new orders (down from 47.2 to 43.0), shipments (down from 46.7 to 43.3), employment (up from 19.5 to 23.3), the average workweek (down from 20.8 to 14.7), capital expenditures (down from 31.9 to 29.4) and technology spending (down from 23.6 to 18.9). The National Federation of Independent Business reported that the Small Business Optimism Index accelerated once again, up from 106.9 in January to 107.6 in February. This edged out November’s reading (107.5) as the highest since July 1983 (108.0). Note that readings above 100 are consistent with strong growth among small business owners, and the robust data seen for much of the past year would suggest a healthy outlook overall in the economy. In that spirit, the percentage of respondents saying the next three months would be a “good time to expand” remained at 32 percent (an all-time high), and the percentage of those expecting sales to rise over the next three months increased from 25 percent to 28 percent. In addition, the labor market remained strong. Those with positions they are unable to fill right now remained at 34 percent. Along those lines, respondents cited the quality of labor (22 percent) as the top “single most important problem,” illustrating the tightness of the job market for small businesses. Taxes and government regulations and red tape both came in second (15 percent). With that said, the net percentage planning to add workers in the next three months eased from 20 percent to 18 percent, a four-month low but still suggesting healthy growth. Similarly, capital expenditures activity remained promising, with those investing in capital during the past six months jumping from 61 percent to 66 percent—the highest point since 2004. Those planning to make a capital expenditure over the next three to six months remained the same at 29 percent. The Federal Reserve Bank of Philadelphia reported that manufacturing activity continued to be healthy in its district in March. The composite index of general business activity eased somewhat from 25.8 in February to 22.3 in March, but new orders (up from 24.5 to 35.7) and shipments (up from 15.5 to 32.4) accelerated strongly at their fastest paces in 12 months. More importantly, just more than 52 percent of respondents said new orders had increased in March, with just 16.4 percent noting declines. In addition, the labor market remained tight, with employment strengthening slightly (up from 25.2 to 25.6) and nearly 35 percent of respondents suggesting hiring had picked up in March. The average workweek slowed a bit in this report (down from 13.7 to 12.8) but remained strong overall. If there is any concern in the data, it is in the pricing figures, as noted in last month’s survey. The index for prices paid pulled back somewhat from 45.0 in February—the highest level since May 2011—to 42.6 in March but remained highly elevated. Moreover, 64.0 percent of manufacturing firms predict higher input costs over the next six months, with that index easing from 65.2—a pace not seen in seven years—to 62.8. This mirrors an acceleration in other pricing data. Meanwhile, manufacturers in the Philadelphia Federal Reserve district continued to be very upbeat in their outlook. The forward-looking composite index increased from 41.2 to 47.9, indicating vigorous expectations for growth in the next six months. More than 60 percent of respondents see new orders rising in the months ahead, with 54.7 percent forecasting higher shipments. In terms of investments in the company, 43.2 percent and 45.4 percent anticipate additional hiring and capital spending, respectively, for the next six months. Retail spending declined 0.1 percent in February for the third straight month, starting the new year off with disappointing consumer data. Motor vehicle and parts sales fell 0.9 percent in February, decreasing for the fourth consecutive month and one of the larger drags in the latest report. Along those lines, retail spending excluding automobiles increased 0.2 percent in February, extending the 0.1 percent gain in January. Despite the softer figures, the larger narrative remains encouraging, with consumers being a bright spot over the past year. Indeed, retail sales have risen 4.0 percent year-over-year in February, suggesting a decent pace overall even if it represented a deceleration from the more robust rate of 5.9 percent in November. Excluding motor vehicles and parts, the pace was somewhat stronger, with retail sales up 4.4 percent over the past 12 months. Retail spending data provided mixed results in February. The largest increases included sporting goods and hobby stores (up 2.2 percent), building material and garden supply stores (up 1.9 percent), nonstore retailers (up 1.0 percent), clothing and accessory stores (up 0.4 percent), food services and drinking places (up 0.2 percent) and miscellaneous store retailers (up 0.1 percent). In addition to declining motor vehicles sales, other segments with reduced spending in February included furniture and home furnishings (down 0.8 percent), general merchandise (down 0.4 percent), health and personal care (down 0.4 percent), electronics and appliances (down 0.1 percent) and food and beverage (down 0.1 percent) stores. Over the past 12 months, the fastest growth in retail sales included nonstore retailers (up 10.1 percent), gasoline stations (up 7.9 percent), miscellaneous store retailers (up 7.5 percent), clothing and accessory stores (up 4.9 percent), building material and garden supply stores (up 4.6 percent) and electronics and appliance stores (up 4.5 percent). Higher prices boosted the jump in sales for gasoline stations. South Carolina created the most net new manufacturing jobs in January, according to the Bureau of Labor Statistics, adding 3,100 workers in the month. Texas (up 2,400), California (up 2,100), Wisconsin (up 2,000) and Iowa (up 1,300) also topped the list of manufacturing employment gains in January. In addition, Illinois saw the greatest job gains in the sector over the past 12 months, with manufacturing employment in the state up 20,200 since January 2017. Other states with the fastest manufacturing job growth year-over-year included Texas (up 18,700), Iowa (up 11,000), Wisconsin (up 9,000), Arizona (up 7,800), Ohio (up 7,600) and South Carolina (up 7,200). The national unemployment rate remained at 4.1 percent in January (and February), staying at its lowest level since December 2000. For January, Hawaii had the lowest unemployment rate in the country (2.1 percent), followed by New Hampshire (2.6 percent), North Dakota (2.6 percent), Iowa (2.9 percent), Nebraska (2.9 percent) and Vermont (2.9 percent). In contrast, Alaska (7.3 percent), New Mexico (5.9 percent), the District of Columbia (5.8 percent) and West Virginia (5.4 percent) had the highest unemployment rates. The University of Michigan and Thomson Reuters reported that consumer confidence rose strongly in preliminary March data. The Index of Consumer Sentiment jumped from 99.7 in February to 102.0 in March, the highest level since January 2004. The press release notes that those individuals with higher incomes felt less upbeat in the most recent survey—likely from volatility in equity markets and the impact that has on personal finances—but that was not enough to drag down the headline index. Indeed, Americans felt more positive about current economic conditions (up from 114.9 to 122.8), with that measure soaring to a new all-time high. At the same time, the index for future conditions pulled back slightly (down from 90.0 to 88.6).